Hammersley Gorge, Karijini National Park, WA. Exmouth is located 1250km north of Perth, the town itself is mainly consumed by Tourism with the world heritage Ningaloo reef just over the range and the Whale Sharks that frequent its waters from April to July. It has everything you need to stock up on supplies, get any repairs done, car servicing or just relax and enjoy the atmosphere of an outback coastal town. There is an airport located at Learmonth about half an hour away which runs flights direct, to and from Perth making it very accessible for everyone. Bec snorkelling at Turquoise Bay, Ningaloo Reef, WA. When we first get into Exmouth, we pull straight in to the RAC BIG4 Exmouth Cape Holiday Park. Its a fantastic park with great faciities, plenty of grass and shade. A mob of wandering Emu’s that cruise around poking their heads into your campsite which is very unique. We base ourselves here for a few days while we get all our washing done, load up with groceries and get excited about what lays ahead in the Cape Range National Park. Exmouth has some great cafe’s, playgrounds and In the centre of town, just near the shopping complex is a free waterpark that the kids absolutely loved. A good bit of info for when you’re planning your trip to Cape Range is that all camp sites can only be booked online. This can make securing a good site hard at late notice as there is a lot of visitors that return each year and book up all the best sites early, staying for weeks at a time. The website is very helpful though as it provides you with maps of each campground which outline the position of each site and how big they are. This helps a lot when choosing a campsite without ever having been to the campground itself. Peak season here stretches from April to October and the area swells with tourists from all over the world. 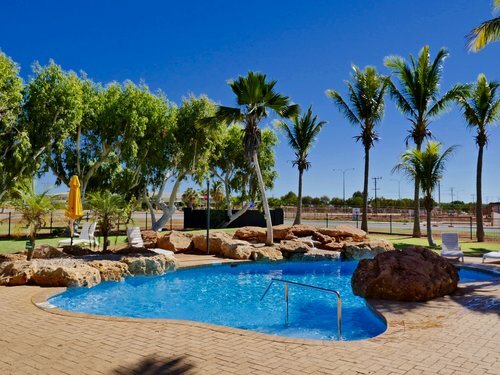 The sites here are some of the best value in Australia, for only $10 per adult per night and kids under 5 are free. 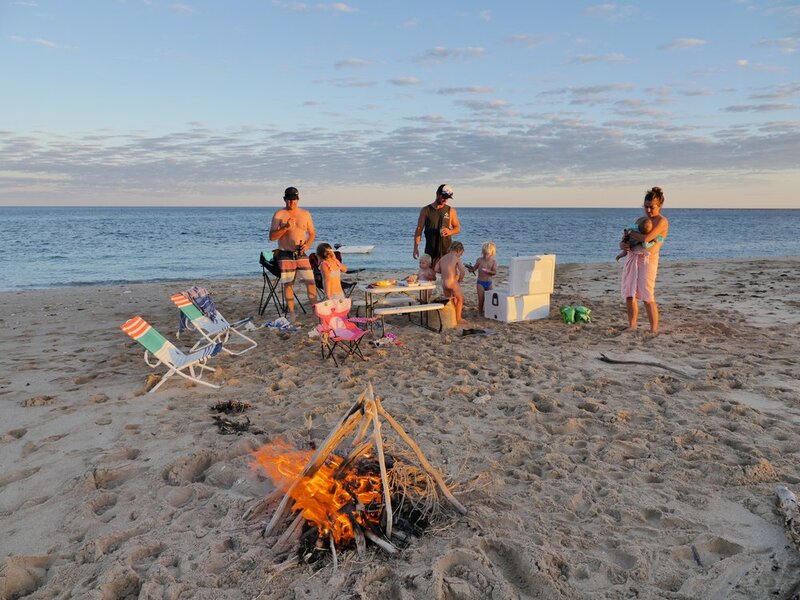 You’re able to camp just metres from the waters of Ningaloo Reef and experience all that it has to offer. The snorkelling, the fishing, the walks and the sunsets are all perfect! Yardie Creek, Cape Range National Park. We chose to stay at Osprey Bay campground for 5 nights. We would love to stay longer but 6 days is about our limit living off grid with our onboard water tanks. We have 180L underneath, but with 5 of us living in the van it can dry up pretty quick. Osprey Bay is the largest campsite in Cape Range, and we believe one of the best. The sites are close to the water, the views are amazing (especially at sunset) and the beach access is perfect for everyone with little sheltered beaches among the rocky shoreline. We spend hours every day lazing around on the sand, snorkelling and building sand castles. With our van parked only a short walk to the beach, we go back and forth several times a day enjoying the warm clear waters. It truly is a Paradise here at Osprey Bay. Just around the point from Osprey Bay is Sandy Bay and there is a walking trail that will take you straight there from Osprey, a good place to get some exercise done to burn off all the Happy Hour cheese and biscuits that are devoured every afternoon. This little bay is so picturesque, a big shallow protected bay with nothing but sand and blue water, another perfect safe place to swim. Our campsite at Osprey Bay. Our first day at Osprey Bay was a total relax and enjoy day. We literally did nothing but eat, sleep, swim and take in the warmth of the sun. The atmosphere here totally surrounds you and its the only place we have been to on our travels where we are happy to sit still and enjoy, not feeling like we need to explore any further. Plenty of fish to be caught on the Ningaloo Reef within appropriate zones. With the sun starting to set and the tide on the rise, it was a good time to head down for a fish. Casting a slow sinking stickbait with a fast retrieve bought about 3 good sized Golden Trevally. A welcome catch on our first day and it provided us with dinner for the next few nights. 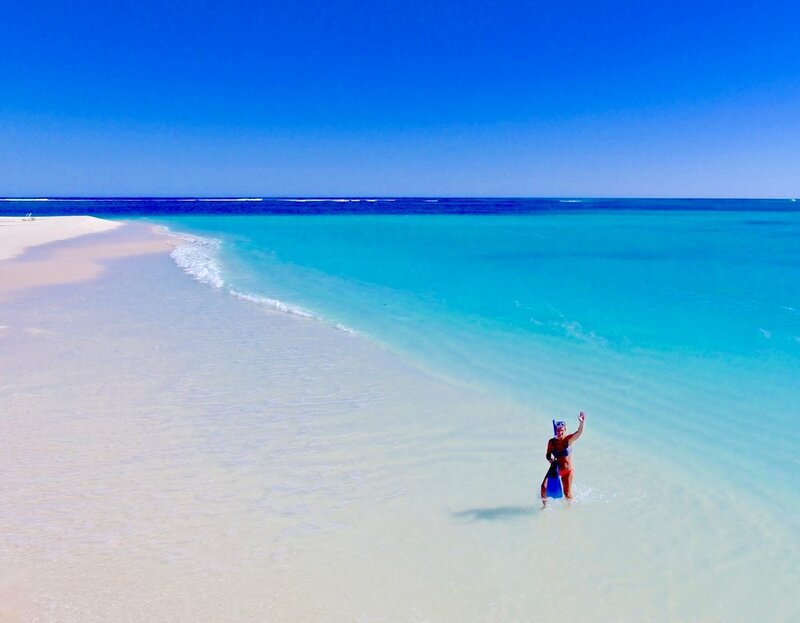 Amazingly blue waters of the Ningaloo Reef. On our second day, my wife Bec had organised a Whale Shark dive, so she headed off early in the morning to meet the crew at the Tantabiddi boat ramp which is around 40 minutes away from the Osprey camp site. This left me with the 3 kids on my own for the whole day which would normally have me freaking out, but having spent so much time with my kids over the last 18 months while on the road, I now think of myself as super dad and can handle anything. There is lots to see and do while camping at any of the sites along the National Park. Starting at the end and working back towards Exmouth there is Yardie Creek Gorge which is a great walk up to the top with some amazing views back down the gorge to the reef. They also run boat tours through the Gorge which are apparently amazing to see. There is the Jarabi Turtle Centre which is a great place to learn everything about the Ningaloo turtle population and their nesting habits. If you’re into snorkelling then there are 2 of the best locations in Australia, The Oyster Stacks and Turquoise Bay. The Stacks can only be snorkelled on a high tide so there is enough water to float over the top of the stacks. And Turquoise Bay has some amazing snorkelling as well, with the natural ocean currents called ‘The Drift’ pushing you along the reef so you hardly have to use your flippers to move along. It is pure bliss floating along these coastlines and you feel so safe that you just lose yourself in the waters and spend hours exploring all the underwater coral bommies and shelfs trying to see more and more amazing sealife. Our 3rd day was spent exploring Yardie creek and the Gorge, the walk is only a 2km return loop and is classed as a moderate or grade 3 bush walk. We managed to do it no drama’s with our 3 little ones and it was a cool adventure that they all enjoyed.. At the entrance to the Gorge where the ocean flows in, there is some great little swimming holes that are great to relax in after the walk. It can get really hot here, so make sure your well equipped with plenty of water and snacks. Day 4 and we head to the iconic Turquoise Bay. The water here has the most unbelievable shade of blue and the sands are some of the whitest in Australia. You only have to step a few metres into the water and dive in with your snorkelling gear on and straight away there is schools of fish cruising around you with not a worry in the world. The water is so clear and the visibility is amazing, it truly has to be some of the best land based snorkelling in the world. Our last full Day in the Cape Range National Park is spent the same as our first. Totally relaxing in the Epic weather that had been perfect our whole stay. A couple of windy mornings that die off around lunchtime which is normal for the time of year, but nothing that interfered with us enjoying the waters and beaches of Osprey Bay. Sunset again brings a few more fish. A good sized Spangled Emperor and another Golden Trevally, a delicious parting gift from the Ningaloo Reef. Checkout time of the campsite is 10am, so with a late start we pack away our camp setup and hit the road with a tear in our eye for the short drive back to Exmouth and the RAC BIG4 Exmouth Cape Holiday Park. For most people travelling to Exmouth, this might be the end of their adventures here and they would move on with their own fantastic memories. But for us, we managed to find another really fun experience to do with the family - Cruise Ningaloo!! We hired a self drive catamaran from Cruise Ningaloo, a beautiful vessel not unlike the self drive cats around the whitsundays in QLD. We opted to have a skipper with us as we have never sailed before and were a bit nervous heading into the open ocean on our own. With a few small bags of clothes and toiletries packed, we leave our van and load up the family onto the Ningaloo Virgin. Its a beautiful boat with 4 seperate sleeping area’s, 2 bathrooms and big lounge area’s inside and out. The facilities on board are not unlike our caravan yet on a much grander scale. We set sail from Exmouth Harbour and head to the Muiron Islands which is about a 3 hour sail on a boat like this. While we sail, we are taught everything about how to sail the Cat on our own. Halfway across we are in total control and feeling like a sea captain from way back. We reach our anchorage in the early afternoon and we have the islands all to ourself. The skipper has a special treat organised for us and we all head to shore in the dinghy for sunset drinks, nibbles and a bonfire on the beach, simply amazing!! We felt very very special to have this all too ourselves, all the camp sites in the National Park are booked out and we have this island to explore on our lonesome. We drift into the night with a few more drinks, some good tunes, great food and some hilarious conversation. Morning on the Ningaloo Virgin brings an amazing sunrise over the water, a fantastic breakfast and some snorkelling straight off the back of the boat. After a leisurely morning enjoying the beach and waters of the Muiron islands we sail back to Exmouth to disembark with some happy memories of a weekend on the water. We then continue on in our Caravan. Sunset, campfire and a cold one. Bliss! We spend another night In Exmouth to sort ourselves out with washing and stocking up on groceries and we head off with excitement to explore one of Australia’s most breathtaking National Parks, Karijini. The drive from Exmouth to Tom Price is approx 640km so it’s a good idea to break up the drive with an overnighter if you can. We chose to stay at Bullara Station which is 120km from Exmouth. It is one of the most unique station stays that we have visited, it has a really great atmosphere with some unique sculptures made from old farming equipment located around the camp. Its home to the best outdoor shower in Australia (in our opinion). The open air showers are heated by a wood fired boiler where gravity feeds the water down to a big galvanised bucket hanging from old tree trunks. It’s absolutely the best way to wash away the outback dust and is something everyone should experience. There is also a daily afternoon damper and campfire which is delicious and it leads into a happy hour with fellow campers accompanied by some great stories around the fire. A long day of 500km gets us to Tom Price and we stay at the only caravan park in town, the Tom Price Tourist Park. It’s a great park and a lot of traveller’s base themselves here and day trip out to the sights of Karijini. There are a few other options for accommodation while exploring the National Park as well. There is the Karijini Eco Retreat and Dales Campground. They are both great campsites and located in different areas of the park which means you can stay in both to be closer to different attractions, although, you can base yourself at one campground and day trip to all the sights. Our recommendation would be to base yourself at Dales campground. It is only $10 per adult per night and it has some of the prettiest gorges, falls and swimming holes within walking distance of your site. We spend our first 2 nights in the National Park at the Karijini Eco Retreat. For $20 per adult per night, it has a cafe/restaurant, toilets and showers and nice big marked out sites with plenty of room for large caravans. This is a great camp to setup and explore Hamersley, Knox and Hancock Gorge. They are all a short drive away and they hold some of the most spectacular swimming holes and walking trails in the park. First up was Hamersley Gorge, a steep rocky decent, but doable with our 3 young ones, to witness this spectacular gorge. The swimming hole was refreshing and we all went in for a dip and swam though the narrow gorge. What an experience! From Hamersley we took the dirt road to Hancock Gorge. We knew that we would have to take this slowly. Navigating rocky steps and climbing over the natural beauty of this gorge was a fantastic adventure for us all. Our 2 year old daughter was strapped to Bec’s back and our 2 boys thought they were world explorers, having an absolute ball. This beautiful setting had us doing the ‘Spider Walk’ and walking through waist deep water, a fun encounter we wont forget! It’s a beautiful 1km Grade 4 walk and well worth it. Our 3rd night we move around 60km to stay at Dales campground. This camp is great for families that have younger kids like ours, the walking trails here are a lot easier and involve a few rocky steps and ladders. No spider walking and climbing that you experience with the harder trails we encountered in Weano Gorge. First stop from Dales is Fortescue falls, only a short walk down a steel stairway and you arrive at a gentle set of falls that run into a clear swimming hole at the base of the rocks. If you follow the signs and keep walking a few hundred metres you will find a place called Fern Pool. Like something out of a movie scene, Fern Pool is just picture perfect, and a top spot to enjoy a bite for lunch or pack your own picnic and spend an hour or two. On our 4th night at Dales Campground we decided to tackle Circular Pool. It is simply magnificent. Located at the bottom of a perfectly rounded oasis containing a swimming hole. This stunning pool is surrounded by a rock shelf flowing with lush green ferns and a waterfall that trickles down the rock face. To get down to the pool, the rocky steps need to be taken slowly as it is quite steep but once you hit your destination you wont be disappointed. The perfect spot for a swim to cool off and capture some amazing photos. One of the most picturesque wonders. We abolutely loved this part of Australia and cannot wait to go back. It's a must see on your travels around Oz and we can't recommend it enough.